Thanks Jared for a great case! This is a young person with a new diagnosis of celiac disease, recent hospitalization for pyelonephritis who is presenting with acute liver injury thought secondary to autoimmune hepatitis versus drug induced liver injury.
) According to this paper from Hepatology that looked at ~150 patients with acute liver failure and 16 with Wilson’s disease, an AlkPhos: TBili ratio of less than 4 has a likelihood ratio of 23 supporting this diagnosis. However, the diagnosis is made by a combination of ceruloplasmin, slit lamp AND a 24-hour urine copper collection followed by liver biopsy. 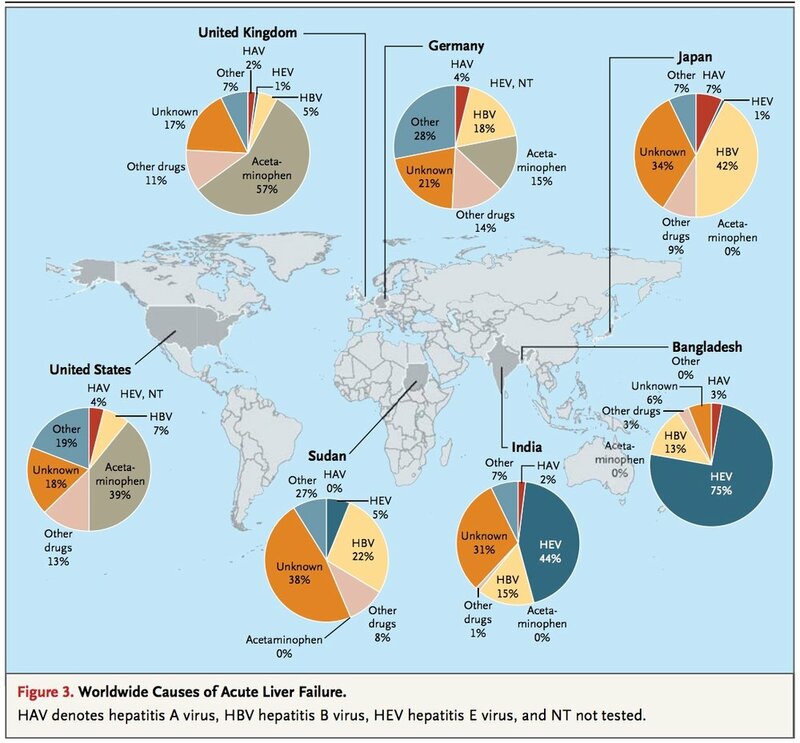 Note that although we think of drug induced liver injury as by far the most common cause of acute liver failure in adults in the US, the slices of the pie shift dramatically when we look globally and when we think about a more young adult population per these interesting pie graphs. It is always good to keep in mind this concept when thinking about "what is my pretest probability that this patient has acute liver failure from x ?" Here is a great NEJM review article that goes over in detail the management of a critically ill patient with acute liver failure.